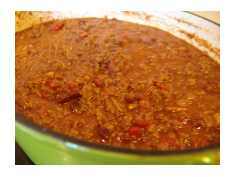 Everyone thinks they have the best chili recipe around, but this one has won a number of local chili cook offs. Why? It's delicious and it's unique, using both ground beef and smoked pulled pork. My wife and I have been tweaking it and improving it for over fifteen years. It is thick and hearty, and...well....just dayum good! It also has two "secret" ingredients that we will reveal for the very first time. As always, I have also created a video that takes you step-by-step through the cooking process. It also includes a brief (and interesting) history on the origins and growth of chili here in the United States. Melt butter into the olive oil over medium-high heat. 1 Jalapeño Pepper - Chopped and Seeds Removed - DON'T RUB YOUR EYES! Saute' over medium-high heat for 5 minutes or until the onions are soft and translucent, and then remove the mix from the pot. Add 1 TBS of olive oil back to the pot. Brown the beef and drain the fat. Then, add in the following ingredients. Simmer with lid off for 3 to 4 hours, occasionally stirring. Then, add the last two ingredients listed below. 1 1/2 tsp of Fuzzy's "Kicker"
Serve with cornbread and your favorite beverage! Leave Chili Recipe and Return to BBQ My Way Homepage.